On a punching power scale of 1 to 10, Chris Brown is around a 6. His bodyguard's punch tips the scale at 10. This was the testimony of Parker Adams, an art student who was asked to evaluate the two men's punching strength in the trial of Brown's bodyguard, Chris Hollosy, whom Adams alleged beat him down so badly last October that he landed in the hospital with a broken nose. Hollosy was convicted Monday of assault in the case for which Brown also faces charges. 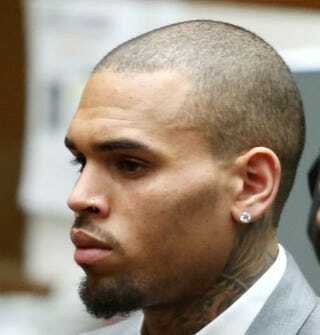 Brown remains ready for trial despite Hollosy's guilty verdict even though, the singer's lawyers told the New York Daily News, the conviction creates a bit of a legal hurdle as Hollosy likely will no longer be testifying in Brown's defense. Hollosy plans to appeal his conviction and has invoked his right to remain quiet in the meantime, the Daily News reports. "He won’t be a witness now, potentially," Brown’s lawyer Mark Geragos said. "I'd rather have him than not have him, but I don’t want Chris to languish in jail while we wait for him." "We're confident that if all the evidence gets before the judge, Chris will be acquitted. Chris did not hit this guy. And if Hollosy did, it was for the defense of others," Geragos said. The Grammy winner's misdemeanor assault trial was to have begun Monday, but is now set to start Wednesday in Washington, D.C. The Daily News notes that Adams told cops the incident occurred after he tried to photo-bomb a snapshot Brown was taking with his female friend. "I ain’t down with that gay s—-," Brown allegedly said, according to Adams. A fight ensued, with Hollosy telling police that he only punched Adams after Adams tried to get on Brown's tour bus, the Daily News reports. Adams, 20, is also suing Brown and Hollosy for $1.5 million each. If convicted of the D.C. assault, Brown faces up to 180 days in jail. Brown may also face more jail time back in California if it is determined that the D.C. incident violates his probation in the 2009 beating of Rihanna. Brown has been behind bars since March 14.